A fatality due to a workplace injury or illness, including if that fatality occurs within 30 days of the injury or illness. The reporting requirements apply to ALL employers, regardless of any exemptions due to industry type, number of employees, or any other reason that would prevent them from maintaining OSHA 300, 300A, or 301 logs. Employers with 10 or fewer employees are still exempt from keeping records of workplace injuries and illnesses. In the old standard, OSHA identified the industries that fell under the requirements of the rule based on the Standard Industrial Classification (SIC) system. That too has changed. OSHA will now use the North American Industrial Classification System (NAICS) to determine the employers and industries that are covered. A list of industries that are partially exempt from these OSHA recordkeeping requirements can be found on OSHA’s website at www.OSHA.gov. As a result of the shift to NAICS codes, it is expected that hundreds of thousands, if not millions of employers, with 10 or more employees, who were once exempt from OSHA’s recordkeeping requirements will now need to begin maintaining OSHA 300, 300A, and 301 logs. It is a good idea for you to check to see if your company’s NAICS code requires compliance with this standard. When asked about the necessity of this regulation change, U.S. Secretary of Labor, Thomas E. Perez, replied, “Workplace injuries and fatalities are absolutely preventable, and these new requirements will help OSHA focus its resources and hold employers accountable for preventing them.” According to a memo released by OSHA, the updated reporting requirements have a life-saving purpose: they will enable employers and workers to prevent future injuries by identifying and eliminating the most serious workplace hazards. While there is merit in these statements, I just hope that OSHA’s recordkeeping systems are prepared for the heavy increase in incident reports about to start coming their way. 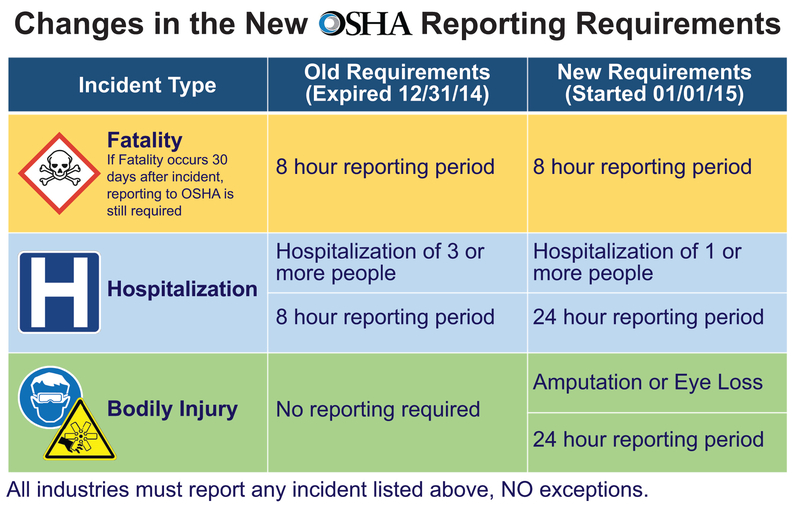 With these regulation changes and the increase in incident reports, it is inevitable that there will be a dramatic rise in the number of OSHA inspections conducted in 2015. In order to be prepared for these inspections, it is vital that all employers are aware of their rights, as well as the rights of their employees, during an OSHA inspection. If you have any questions on how to handle an OSHA inspection, there is a step-by-step guide from a previous article “Dealing With an OSHA Inspection“. One very important note to keep in mind with what and when you will need to report to OSHA is that these injury & illness reports, regardless of how the incident happened, will be made public on OSHA’s website where they can be viewed by any employee, union representative, lawyer, and competitor. If you are unsure whether your facility/company is required to maintain records of workplace injuries and illnesses, you should immediately verify if you are covered so that you will not fall behind in tracking recordable incidents. You should also ensure that your Human Resources department, EHS Manager, or any other person responsible for employee health and safety is aware of and understands the new reporting requirements. Below is an infographic that may help put all of the information that I have presented in consolidated format. Contact us to find out how we can help you with any of your OSHA Compliance needs.